The Medieval Warm Period in Antarctica: How two one-data-point studies missed the target | Watts Up With That? A common claim by warmists in the climate debate is the alleged absence of the Medieval Warm Period (MWP) in the Southern Hemisphere. In a previous post we discussed the MWP in Australia, New Zealand and Oceania. In the following, we will take a look at Antarctica. Whereas SST [sea surface temperature] to the west of the Antarctic Peninsula shows similarities to Northern Hemisphere climate over the past 2,000 yr, the JRI record shows an opposing temperature excursion which demonstrates that the Antarctic Peninsula did not experience a widespread Medieval Warm Period/Little Ice Age sequence comparable to Northern Hemisphere climate at that time. Warming at JRI has been ongoing for several centuries, although the warming by 1.56°C over the past 100 yr (red lines in a and b) is highly unusual in the context of natural variability. Figure 1: Temperature reconstruction for the JRI ice core from James Ross Island. From Mulvaney et al. 2012. As part of our ongoing crowd-funded MWP Mapping Project we have recently studied the available literature of the region (Fig. 2). Is the ice core data of the Mulvaney group representative for the Antarctic Peninsula or at least the eastern part? A quick look at the map shows that the study represents the only known case with an anomalous temperature evolution during the past millennium (grey dot). All other data points show MWP warming (red dots). Fig. 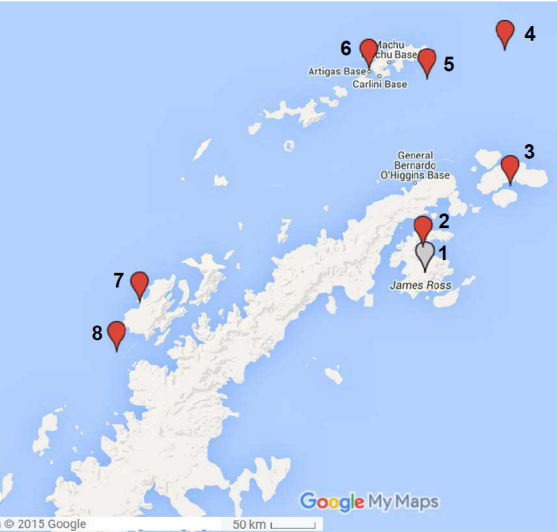 2: Overview of MWP studies in the Antarctica Peninsula region. Red dots indicate studies with MWP warming, grey dot marks study with mismatch to MWP concept (Mulvaney et al. 2012). Numbers refer to locations in text. Interactive online map here. 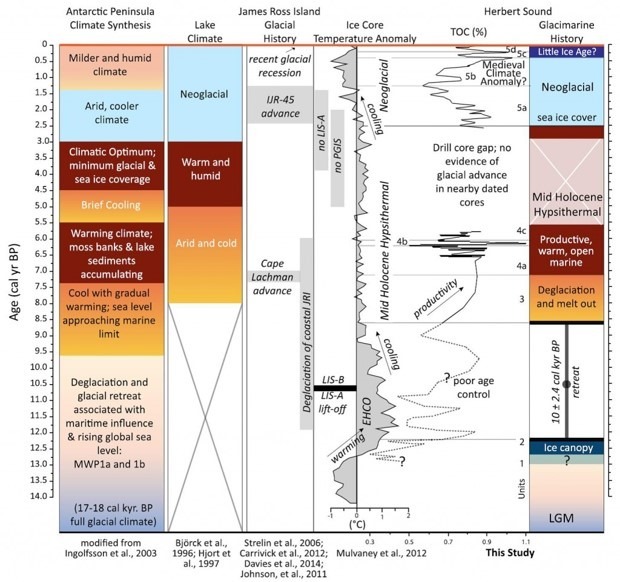 A new paper published on 1 December 2015 by Rebecca Totten Minzoni and three colleagues in Quaternary Science Reviews sheds new light on the anomaly reported by the Mulvaney group. The Texan team from Houston and Austin studied diatoms and petrography in a sediment offshore core, located merely 25 km north of the ice core. Interestingly they found a distinct 200-year long peak in organic matter related to life-friendly warming conditions with a warm-water diatom assemblage (DA1) centred around 1000 AD (peak ‘5b’ in Fig. 3). It becomes clear that the MWP is well represented also on the James Ross Island region. The Minzoni study confirmed that the area seems to have experienced an additional warming phase after 1600 AD which is indeed unusual. Is this local anomaly possibly related to volcanism in the region which is known to have interacted with the glaciers (e.g. Hambrey et al. 2008)? More likely, however, this is a more regional feature in Antarctica, because similar warming episodes during the LIA have been also reported in other studies in West and East Antarctica (see below). Detailed curve correlation will be necessary to exactly map out the area of these LIA anomalies. Regardless of the explanation, the LIA warm phase in the region of James Ross Island does not conflict with the MWP concept. MWP rejection by Mulvaney et al. therefore has no sound basis. 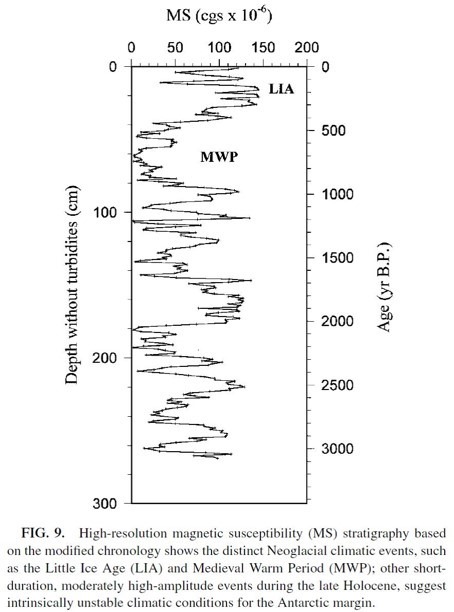 Pronounced minimum in magnetic susceptibility (MS) between 1050-1550 AD which indicates a section that is dominated by biogenic sediment (Fig. 4). Presence of biogenic sediment in this environment reflects high biological productivity associated with a warmer period and minimal sea ice. Strong increase in MS from 1550 AD onwards marks change to clastic-rich section and low productivity conditions associated with cold conditions. Little Ice Age conditions lasted 1550-1850 when another sharp drop in MS is recorded. Fig. 4: Magnetic susceptibility in core A9-EB2, eastern Bransfield Basin. From Khim et al. 2002. Study of isotopes and geochemistry. Warm Phase 400-1500 AD, preceded and followed by cold phases (Fig. 5). Fig. 5: Warm (pink) and cold (blue) periods in the Bransfield Basin. From Barnard et al. 2014. The author studied radiocarbon dates of moss incorporated in glacier ice. Result: In 1300 AD the studied glacier was at or behind its present position. Temperatures have been similar to or possibly warmer than today. From 1300 AD onwards, a major glacier advance commenced, associated with the cooling of the Little Ice Age. This was the most extensive advance of the last 3500 years. Hall et al. 2010 studied radiocarbon data from moss and shells recently uncovered by retreating ice. Result: Peat from sediments overrun by glacier ice dates between 707 and 967 B.P. (1033 AD and 1293 AD) which indicates that the ice edge was at or behind its present position 1030-1300 AD. During this period the area was at least as warm as, or likely even warmer than, the peak warmth of the Current Warm Period. 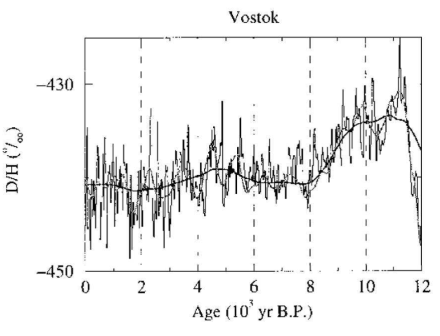 Domack & Mayewski 1999: Warm phases 900-1100 AD and 1250-1400 AD. The warm phase is marked by low magnetic susceptibility (MS) values, corresponding to an increase in biogenic sedimentation under warmer conditions. 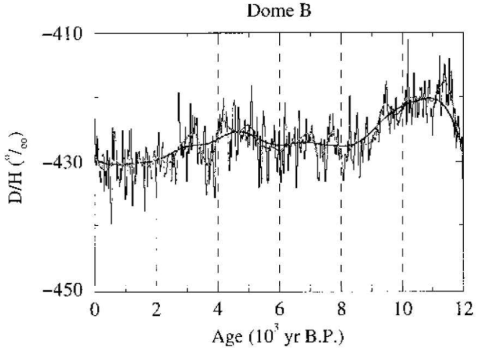 Entire climate record of past 3500 years is characterized by typical 200 years climate cycles, possibly corresponding to solar Suess-de Vries cyclicity. Shevenell et al. 2011: Poorer temporal resolution than curve from Domack & Mayewski. General warm phase 400-1500 AD with abrupt cooling towards subsequent Little Ice Age. Warming at 400 AD equally abrupt, marking transition of Dark Ages Cold Period to Medieval Warm Period. See also follow-up work by Etourneau et al. 2013. Fig. 6: Temperature reconstruction for ODP well 1098 (graph from Mulvaney et al. 2012, data from Shevenell et al. 2011. All of the discussed studies from the Antarctic Peninsula provide robust evidence for significant warming during MWP times. In contrast to Mulvaney et al. 2012, there is no reason to assume the MWP might not have affected the entire peninsula. As part of our global MWP mapping project we have compared the results of Tavernier et al. 2014 to other studies in the region. Astonishingly, all other ten studies document the MWP rather well (Fig. 7). Another case, where researchers appear to have extrapolated their results much too generously and quickly across the region, without thoroughly consulting the available regional literature. 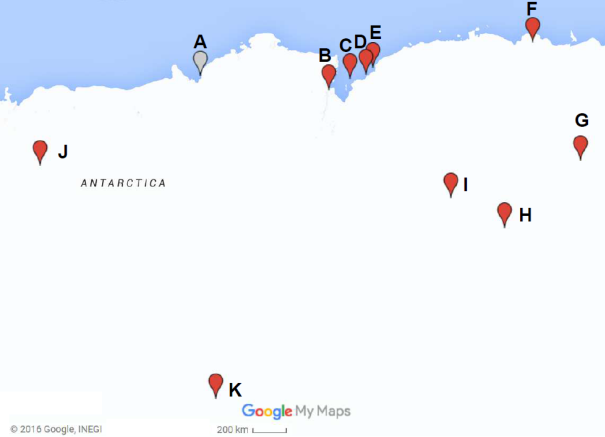 Figure 7: Location of MWP studies in coastal East Antarctica. Red dots indicate studies with MWP warming (Tavernier et al. 2014), grey dot marks study with mismatch to MWP concept. Letters refer to locations in text. Interactive online map here. The group studied fossil pigments, sedimentological and geochemical proxies and carried out absolute diatom counts. According to the authors there is “no evidence for a Medieval Climate Anomaly, Little Ice Age or twentieth century warming in our lake sediment record”. Brief period of slightly increased primary production and warming occurred between 1510-1560 AD. Study of diatoms and geochemistry. Result: Warm conditions between 500 to 1000 AD, indicated by high accumulation of organic matter and reducing bottom water conditions, preceded and followed by colder periods. Note that the study comprises a long 12,000 years (i.e. low time resolution) so that the warm peak may be somehow shifted. Peak in total diatom and Fragilariopsis curta species abundance at around 1250 AD indicates that the shelf ice edge had further retreated than its present position, indicating warmer conditions than present at the time. The peak coincides with a minimum in the abundance of the species Thalassiosira antarctica which fits with the warming interpretation around MWP times. Study of diatoms. 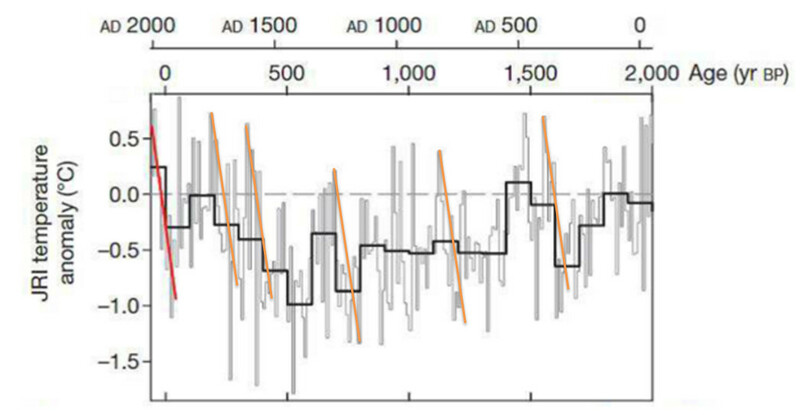 High lake level 600-1200 AD triggered by warm conditions that led to increased humidity (Fig. 8). Subsequent cooling and lake level fall due to drier conditions. Another warm period centred around 1550 AD with subsequent cooling / lake level fall. Lake level rise during 20th Century warming. Fig. 8: Reconstructed depth and salinity in the lacustrine zones of the Kirisjes Pond core based on diatoms. From Verleyen et al. 2004. Berg et al. 2010 studied total organic carbon and C14 age dates. They found a peak in organic carbon content centred around 1000 AD, indicating more favourable / warmer conditions for organisms around this time (Fig. 9). Fig. 9: Total organic carbon in core from Prydz Bay. From Berg et al. 2010. Dahl-Jensen et al. (1999) and Roberts et al. (2001): Warm Period 700-1050 AD and 1350-1750 with cold phase in between. Significant cooling commences at 1750 AD, related to Little Ice Age which ends 1950 with major modern warming. Morgan & van Ommen (1997): Illustrated ice core data start in second half of Medieval Warm Period and includes a significant winter warming event centred at 1425 AD lasting for 50 years. Winter temperatures dropped markedly from 1750 AD onwards, initiating the Little Ice Age. Warming from 1900 onwards marks beginning of Modern Warm Period. The ice core has been investigated by deuterium which reveals a warm Phase 700-1200 AD (Fig. 11). Fig. 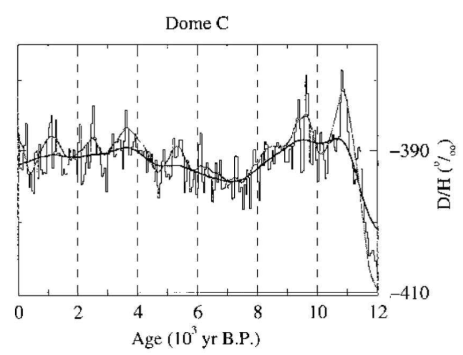 11: Deuterium curve as temperature proxy for Dome C ice core. From Masson et al. 2000. 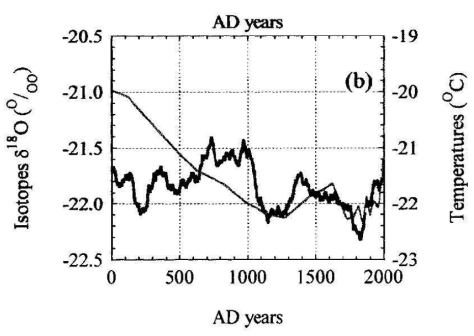 Study based on deuterium which shows an extended warming peak 500-1500 AD (Fig. 12). Fig. 12: Deuterium in Vostok ice core. From Masson et al. 2000. Deuterium as temperature proxy. Warm phase 800-1500 AD (more positive deuterium values indicate warming, upward peak in curve), interrupted by short cooling episodes (Fig. 13). Fig. 13: Deuterium in Dome B ice core. From Masson et al. 2000. Delta18O in ice core as temperature proxy. 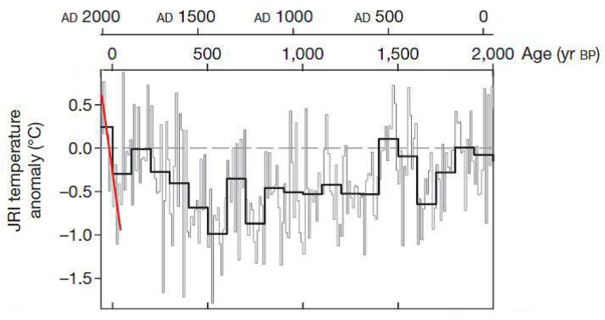 Warm phase 1000 AD (start of data set) until 1250 AD when cooling started (Fig. 14). Maximum cold conditions of Little Ice Age centred around 1500 AD. Attached curve: More positive values in oxygen isotopes indicate warming (upwards peaks). Fig. 14: Oxygen isotopes of Dronning Maud Land ice core. From Graf et al. 2002. Delta18O as temperature proxy. Warm Phase 950-1100 AD (Fig. 15). More positive oxygen isotopic values indicate warming. Fig. 15: Oxygen isotope curve of the Plateau Remote ice core. Graph from Leduc et al. 2010. The MWP is well documented in the vast majority of the discussed studies across East Antarctica. The exact timing and possible regional differences of the MWP warming still have to be worked out. At some stage in the future it is planned to download and/or vectorise all curves to plot them all in a consistent style and age-format. In some studies, the MWP warming appears to be front-loaded during the general 800-1200 AD MWP period, in others more back-loaded. Whether this is real or an age-dating artefact needs to be thoroughly checked case by case. 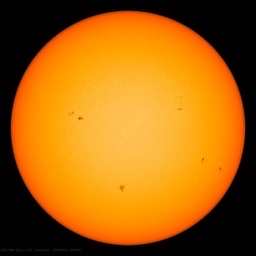 In some areas, an unusual LIA warming episode is recorded around 1550 AD which seems to be real. It has to be noted that Antarctica also today experiences a special development that does not necessarily follow the global trend. According to Wagner & Zorita 2015 there has been no warming in Antarctica during the 20th Century, when at the same time global temperatures rose by nearly one degree C. Clearly, a robust documentation of Antarctic temperature changes during the past few thousand years is needed, specified by sub-regions. The literature overview presented in this article indicates that it may not be sufficient to model the whole continent using one high resolution ice core or a single study. Regional variations do occur, nevertheless, the MWP warming signature seems to be present across Antarctica. It is unfortunate that Tavernier et al. 2014 have chosen to declare their one data point to be representative for a whole continent and in fact the entire southern hemisphere, when the real picture looks very different. February 2, 2016 in Climate News. Indeed – but after a rigorous cherry-qualification progress, it would seem. Thank you so much for this fine summary ! See page 275, fine brilliant MWP just near the South Pole, not so bad. I’ve got a tree in Yamal that these authors would surely like to buy. There’s also plenty of evidence for the MWP in the SH from South America, Africa and Asia. Thank you for this most helpful overview. Some may recall the kerfuffle around #3 that happened in 2012 when it was published. Both the ikaite abstract and the Syracuse PR about the paper (both quoted above) were clear that a MWP and LIA signal had been detected on the Antarctic penninsula. 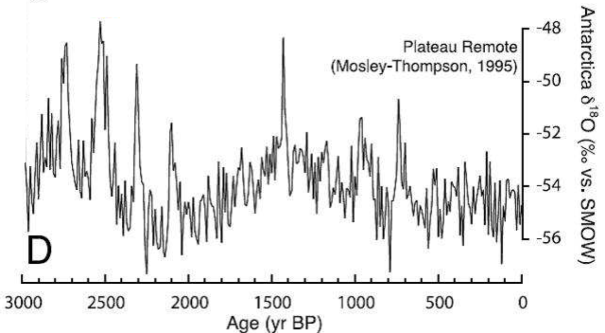 This contradicted the warmunist propaganda that even if the MEP was real (Mann’s hockey stick said it was not, but Mann could not disappear Norse ruins on Greeenland), it was localized and nothing to do with global climate. This got picked up by the media (and IIRC, WUWT) and that unleashed a warmunist firestorm. To such an extent that Lu (in order not to be excommunicated) essentially disavowed his conclusion in the abstract. That disavowal still features at all the usual suspects, starting with SkS. What you do here is show how right Lu was scientifically, and how wrong his subsequent disavowal. For completeness, are you aware of any other studies concerning the MWP in Antarctica what weren’t discussed in this post. If so, what criteria were used to decide which studies to discuss in this post. I selected only a subset of the studies for this post to discuss the Tavernier et al. and Mulvaney et al. works. Otherwise it would be too boring / too encyclopedic (-; I have a handful of other Antarctic studies still in the queue which may be added soon. For the love of christ. Climate change never happened until 1950. /insanity. This is what I have come to expect from the warmunists. If there are 10 pieces of data and one of them agrees with their views, the take that piece and throw out the other 9. And if none do, they’ll make something up. Antarctica has not warmed in the 21st century and by some measures has been cooling slowly for many decades. But CO2 has risen over Antarctica, tailing global CO2 increases by about 15 ppm. What do climate models make of this? How much should Antarctic temperatures have risen from the CO2 and if not enough to satisfy the models, what next? But that contradict’s Cowtan and Way’s 2014 study that claimed the polls were warming 8 times faster than the rest of the planet. Is their two-year-old study already obsolete? It seems that those who live by climate models will die by climate models. Obviously, the Antarctic CO2 didn’t come from a coal-fired power plant and therefore it has no effect on temperature. There are a lot of different types of proxies represented on these maps. The differences in proxy type are of significance. Some proxies are more location specific than others. The proxies based on isotope ratios measure the composition of the atmosphere at the time of deposition and are therefore responsive to global (or at least regional) temperatures. They are not simply a measure of temperature at the one specific location they were taken. Ice core temperatures on the other hand are a proxy for the temperature at one specific location. Measures of biological activity like diatom counts are also fairly local. Sediment deposition proxies on the other hand are cryptic. Sediment proxies measure something which may be related to temperature; but what they measure and how sensitive they are is strongly dependent on the local geography. In Antarctica where the local geography is rather variable, interpreting them is likey to be difficult. As no single proxy is completely reliable, it is always best to use an ensemble of proxies. Making inferences using only one proxy is not the way to do it. I can understand however that those taking proxy measurements will wish to make inferences from their specific data when they are writing up their results. There is nothing wrong with that. But studies that integrate a number of proxies, if properly done, will be more reliable. The problem as I see it is not with the scientists taking these proxies and writing up their results. Rather the problem is with those who cherry pick one study to make their point and ignore all the others that do not. As a tribute to the late Bob Carter, I thought I would look at the claim at the top of the article. Mulvaney et al. 2012 said in Nature. Warming at JRI has been ongoing for several centuries, although the warming by 1.56°C over the past 100 yr (red lines in a and b) is highly unusual in the context of natural variability. Carter kept carping on about their being nothing unusual about recent warming. So I copied the red line. At least five times in the past 2000 years when there have been similar leaps in temperatures. Nothing unusual in the current temperature level either. ….. very good comprehensive study for Antarctica/SH reference purpose. The study clearly reveals two entirely wrong outlier studies, those of Mulvaney and Tavernier. Those authors prove that they are unable to do serious scientific work and should suffer the consequences. the y-axis is mislabeled – such is the quality of paywalled peer review. This is very impressive to me (as a non-expert), albeit some of the noisy charts might need some statistics to back up that the claimed patterns are significant. Those Big Oil cheques are really paying off with some quality research! Don’t Journals sometimes include review articles? It won’t be my sweat, but it would help the world if the review could be made genuinely comprehensive and appear in the peer-reviewed literature. Yes, absolutely. I am planning to write some MWP review articles once the first data collection phase of the project has been accomplished. According to Schmithusen et al., 2015, the observed greenhouse forcing for CO2 is close to zero (W/m2) and sometimes even negative (leading to cooling) for Antarctica. In other words, increasing CO2 concentrations has little to no impact on the greenhouse forcing effect for the Antarctic climate. The CO2 GHE is “comparatively weak” for Greenland too (~5 W/m2 in absolute greenhouse forcing), especially when compared with the tropics (~30 W/m2) and the rest of the globe. (See full color Fig. below.) This would imply that the polar ice sheets are only modestly to negligibly affected by CO2 greenhouse forcing, and thus other mechanisms are influencing the surface mass balance of the ice sheets.